Governor Andrew M. Cuomo today toured the 9th Avenue subway station on the D Line in Sunset Park to demonstrate innovative technology the MTA is deploying to speed subway repairs and address signal delays. This work includes replacements of insulated joints -- the failure of which is one of the most common causes of signal related delays -- and the deployment of a simple yet innovative "magnetic wand" used in the UK to remove conductive material on the tracks that causes insulated joint failures and leads to delay-causing red signals. 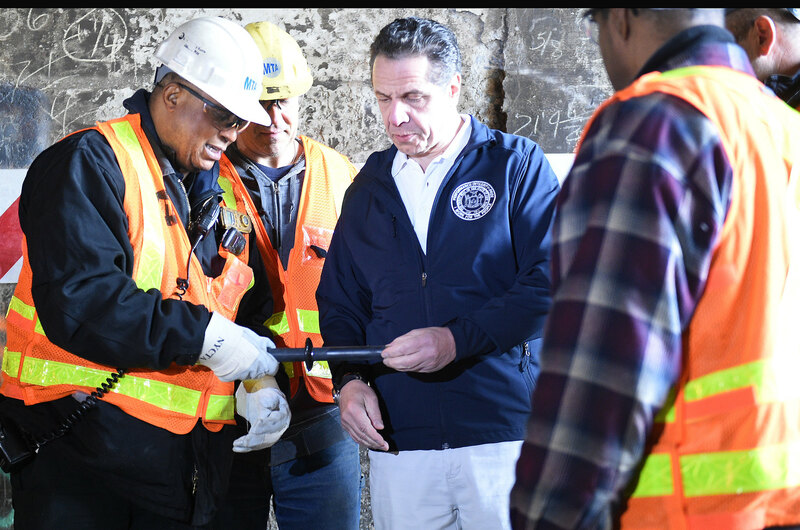 The Governor announced that the Subway Action Plan, which is now fully funded thanks to the recently passed State Budget, will fully deploy an additional 700 wands for a total of 1,000 and will clean all 11,000 priority insulated joints—half of the 22,000 insulated joints in the system--by the end of November of this year. "New York City subways are reliant on 100-year-old track and signal technology that will disrupt a commute on a moment's notice," Governor Cuomo said. "While we invest in 21st Century technology to modernize the system in the long term, we're also supporting the MTA's work to stabilize the system in the short term. The fully funded subway action plan is going to allow the MTA to deploy innovative technology that will reduce signal-related delays and bring relief to riders faster than ever before." "The full funding for the Subway Action Plan as secured by Governor Cuomo in the state budget is going to go a long way to help commuters, and this is just one example how," said MTA Chairman Joseph Lhota. "This initiative is a successful example of how the Plan is connecting our hard-working workforce with creative technology that will improve service." The fully funded subway action plan is going to allow the MTA to deploy innovative technology that will reduce signal-related delays and bring relief to riders faster than ever before." "These brilliantly simple tools have already helped us remove almost 600 pounds of delay-causing steel dust and we look forward to removing a significant amount more thanks to the now-fully-funded Subway Action Plan," said NYC Transit President Andy Byford. "This is exactly the kind of approach we're looking to replicate across all our disciplines at New York City Transit - out-of-the-box thinking to find a simple and easily deployable solution that will have a real impact on our customers." Insulated joints are insulated electrical connection points that are used in the subway system's fixed block signal system. When a train is in a block (a section of track), it activates a relay that turns a signal to red to ensure that trains do not make contact with one another. When an insulated joint is compromised by a conductive material such as steel dust, it will cause an unintended electrical connection, falsely report a train in a non-occupied block, and the signal will go to red. This causes delays in service by stopping a train when it should be clear to proceed. Insulated joint failures are one of the most common causes of signal related delays. All insulated joints are checked every 90 days. There are currently 286 open defects in relation to insulated joints. With the additional funding for the Subway Action Plan provided in the State Budget, NYC Transit will be able to cut the overhaul time of these 286 insulated joint defects in half, from 50 weeks to 25 weeks. 105 insulated joints have been overhauled since June 2017. The additional magnetic wands that will be purchased with the additional funding will enable NYC Transit to have all 11,000 priority joints, or half of the 22,000 joints in the system, cleaned by the end of November 2018. Before the implementation of the Subway Action Plan, the only means of correcting or deterring insulated joint failures was by either removing a conductive material, wiping down and wire brushing the insulated joint, or replacing the joint itself. As part of introducing new means and methods of proactive signal maintenance, a magnetic wand was tested and introduced. The hand-held tool is waved across a joint and picks up conductive steel brake dust that cause insulated joint failures. Although use of these tools is in its infancy, the magnetic wands have already shown, by removing a total of 581 pounds of steel dust over 821 insulated joints, that the simple technology will work in significantly reducing the amount of delays associated with insulated joint failures by steel dust. The wands have already allowed for a level of dust removal that would have been impossible with previous "wipe down and brush" method. There are currently 300 magnetic wands on hand, with an additional 700 on order thanks to additional funding secured by the State Budget. In addition to being used by signal personnel and track personnel performing mobile vacuum cleanings, all Combined Action Teams (CAT teams) have the wands in their response vehicles.